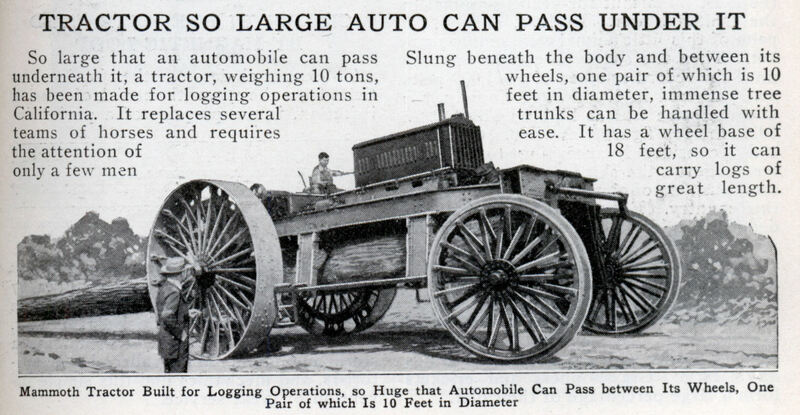 So large that an automobile can pass underneath it, a tractor, weighing 10 tons, has been made for logging operations in California. It replaces several teams of horses and requires of only a few men Slung beneath the body and between its wheels, one pair of which is 10 feet in diameter, immense tree trunks can be handled with ease. It has a wheel base of 18 feet, so it can carry logs of great length.